A very exciting new fibre is on the horizon! Now Lenzing Group have just launched TENCEL™ Luxe branded filaments, the new player for sustainable high-end cellulose textiles! Offering superior aesthetics, performance and comfort level that allow them to be the perfect partner with other noble fibres such as silk, cashmere or wool. The smooth surface of the TENCEL™ branded Luxe filament gives fabrics a silky smooth feel and liquid-like drape for the most sensual silhouettes. Moreover, TENCEL™ Luxe branded filaments are naturally breathable due to their wood-based origin (from sustainable forest plantations certified Forest Stewardship council FSC) and offer outstanding colour fastness, enabling designers to express bold colour palettes where creativity knows no boundaries. Back in the 1980s with the invention of the TENCEL™ fibre, a new chapter in fibre history was opened. The innovation made the viscose process cleaner and more environmentally friendly. It has all the beautiful handling properties without leaking toxic effluent that damages our environment. Tencel™ is a fibre now well known in the textile industry for producing excellent more sustainable fibres, suitable for crafting in to durable denims, too. The Sustainable Angle supports welcomes fibres such as this. Extending the fibre basket and providing a greater range of sustainable fibres with a diversity of characteristics to meet the fashion market’s need for sustainable, low impact fibres. We are excited to see these new materials very soon in our studio. 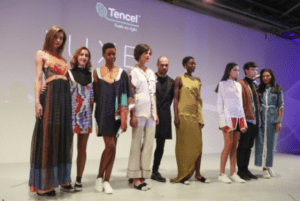 Tencel™ Luxe is truly a fibre for the future! Along with Tencel™ Luxe materials, we are excited to showcase other Tencel™, Lenzing Modal ™, Refibra, Ecovero and blends, over 3,000+ more sustainable materials at the Future Fabrics Expo in January 24-25th January 2018. Lenzing Group is a world market leader based in Austria with offices and facilities worldwide. Lenzing Group supplies the global textile industries with high-quality, botanical cellulose fibres. Modal™ and Tencel™ are two well-known examples. 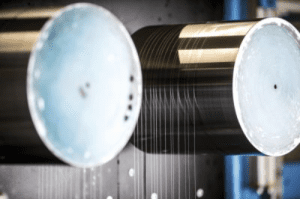 TENCEL™ is a Lyocell fibre from Lenzing. It is of botanical origin since it is extracted from the raw material wood. The fibre production itself is particularly environmentally friendly because of a closed circuit.